Tom King's Rebirth Batman run continues to be controversial, even up to and including criticism from some parts sparking a change in the first hardcover collection. That "love it or hate it" dichotomy surely continues into King's Batman Vol. 3: I Am Bane; as the third part of King's inaugural trilogy, this is the volume perhaps toughest on the reader. Even despite plenty esoterica around the edges, the first volume offered a traditional hero versus villain structure and the second a heist caper. The third has Batman set against his arch-nemesis Bane, something we've seen plenty times before, and in terms of linear plot structure spends a lot of time with the two in fisticuffs. That is, there's not as many places here for King's higher concepts to hide, and that makes for greater space than in the first two books where it's incumbent upon the reader to provide the meaning in all that King and his characters do and don't say. There is a touch of the mundane and a touch of the grand in the sequence where Bruce Wayne meets his gathered Robins in a Batman-themed fast food joint to warn them off from his pending fight with Bane. It is a conversation of the type we've seen so often for so long now, in really every Bat-event, that it becomes a parody of itself; at the same time, King has the wisdom to set it at this utterly ridiculous restaurant, an absurd demonstration of the snake eating its own tail. Depending on your point of view, this is wholly regurgitated Bat-fluff or it's entirely self-aware regurgitated Bat-fluff, in some respects purposefully tired because one of the main ideas of this storyline is that Batman himself is exhausted by the constant repetitiveness. At the outset, King's new character Gotham Girl told us from the future that she'd be killing Batman, and given her brother's evil turn, this seemed most likely in the physical sense. But we learn here -- perhaps -- that Batman originally saw Gotham Girl and her brother as an opportunity to stop being Batman, a hope that was dashed when the Psycho Pirate broke their minds. Even despite that, at the book's end Gotham Girl finally convinces Batman to go seek his own happiness -- breaking the tired cycle King alludes to -- and he proposes to Catwoman. (Clearly the events of the Button crossover with Flash that takes place in issues omitted from this volume must also factor into this decision, though unfortunately King doesn't reference it.) One wonders if some of the trademark repetitive patois of King's run so far will fade now that Batman has broken his own cycle (a theme going back to Batman: Rebirth and Calendar Man and the continued abuse of that poor Year One tree). Indeed the repetition is heavy here, and again harder to avoid because there's less else happening on the page. The first issue scene with Batman, Catwoman, and Commissioner Gordon is a particularly egregious example. "Egregious" is a strong word here, however; in essence what King writes is poetry in dialogue, or the rat-a-tat-tat banter of the kind we expect from a Mamet or a Sorkin. Possibly the reason it specifically grates in Batman is because of a comics issue's small real estate and the fact that this kind of sparse dialogue essentially means fewer words for your nickel and a shorter reading experience. Clearly King isn't writing this way for lack of ability to do otherwise, as the expansive scene in the restaurant and King's other works attest. I'm predisposed to be skeptical, if not totally against, this proposition that Batman and Catwoman get married. Under other circumstances, I'd say it seems to obviously predestined to fail under angst-ridden circumstances and also limits the romantic possibilities for each character should a Silver St. Cloud or Slam Bradley come back into town. But Rebirth has made a cottage industry of happy super-couples, and though I think it ill-advised for the latter reason, it wouldn't surprise me if we end up with stories of a married Bruce and Selina. Heck, I even take Gotham Girl at her word and I fully believe King will see this through to Batman hanging up his cowl, before the next relaunch comes along and another writer puts him back on the streets. 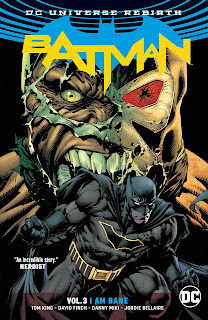 I Am Bane ends with King and frequent collaborator Mitch Gerads teaming Batman with Swamp Thing, a jocular tale of Alfred cleaning up mud and Swamp Thing wedged into the Batmobile -- until Swamp Thing brutally murders a villain in the end while Batman watches helplessly. King does well thwarting our expectations here, and another character King ought write aside from the Flash is Swamp Thing. Inasmuch as I've enjoyed having Swamp Thing back in the mainstream DC Universe, the humanizing effect that comes with this isn't entirely true to the best of the character. I don't expect King's issue to stick as the ongoing presentation of Swamp Thing, but it's a wonderful subversion, starting with the comedy of the domesticated Swamp Thing and finishing with Vertigo-esque horror. Tom King's Batman Vol. 3: I Am Bane gets downright brutal at times (as illustrated by David Finch), whether it's hanging Robins, Bane tearing his way through a gauntlet of Batman's rogues, or Batman and Bane beaten to bloody pulps. And yet (and yet, and yet), this is by far the most cerebral of King's volumes, overflowing with word puzzles and disassociating from the main action more often than not. With the next volume, King switches horses entirely for a tale from Batman's past, and I'm curious to see whether that snaps the book into narrative focus or if King's Batman continues to float even farther toward the atmosphere. Without spoiling anything, the story told in The Button certainly seems to be somewhat relevant to Bruce's state of mind re: Selina, retiring, being happy. Of course, who knows if that's intentional since Tom King pulled his name off the writing credits for the second Batman issue. This is probably a case where collected editions are the suboptimal way to read the story - I mean, I'm glad they didn't try to put the last two issues in their own trade with some random flotsam (has the annual been collected yet? ), but I always blanch a bit when a series I read in trade skips around a bit. Can't wait for you to get to The Button. I have a lot of thoughts. Like, angrily took his name off the credits? It's weird because those events seem obviously to factor into these, but there's not even like a "I had a strange encounter the other day" to Gotham Girl when she and Batman are talking. Like, that event happened in this Batman book; I think the complete ignoring of it does the reader a disservice. As far as I know, Josh Williamson wrote that second issue, so it had nothing to do with what King might have thought. Yeah, but still, a good editor's got to say, "Y'know, this and this link a little bit ..." And why wouldn't King still want to acknowledge something that happened in the previous issue of his own book? I read everything up to the issues that happen after "The Button". I thought it was a good story, again King is putting the tone on what Bruce is willing to sacrifice as Batman. I did have a feeling at the start of the second issue that I missed a part of the story with an ending that dramatic in the first issue. It left such a big gap that went unexplained. You mean from Catwoman to Swamp Thing? I actually think these were published with the Swamp Thing issue coming first. I meant that I didn't read any of the issues that came after "The Button", so I've only read the Bane part and I haven't read anything about Swamp Thing. The sudden gap in story was about the boys literally being hanged and left for dead in the batcave and the next story they regenerating in Superman his cave as if everything is fine. That left so much questions... How does Bane know about it (he isn't the type to figure that out and he doesn't have that kind of resources) and how can you go from presumed dead to everything is fine without as much as en explanation, it took away a lot of the dramatic ending of the first issue. Oh and I think you're talking about them putting issue #24 before issue #23 in the TPB and the addition of the "Good Boy" story from the Annual that's printed between them even though it was published half a year before them. I didn't read the issues, but I did check the cover pages. Also do you know if they've collected the other stories of the Annual? Some of the other Annual stories are in the new Rebirth holiday collection; I'm not sure besides that. There's a throwaway line later in the book when Batman's fighting Bane about what happened with the boys. I agree it was kind of sudden, but maybe by design. I figure Bane knows about the cave because he's been there before, a la Knightfall -- we don't know for sure but presumably at least some of that has happened again. Hey could you tell us if the credits in this is on page ala the recent deluxe edition (and presumably floppies) or on the reverse of the covers like the first (and presumably second) tpb? Reverse of the covers or where they appear in the original issues.